853 B.C. 848 841 835 814 798 796? Date written: Probably during the time Joel may have prophesied, from approximately 853-796 B.C. Setting: The people of Judah had become prosperous and complacent. Taking God for granted, they had turned to self-centeredness, idolatry, and sin. Joel warned them that this kind of life-style would inevitably bring God's judgment. Key verses: "That is why the Lord says, 'Turn to me now, white there is time. Give me your hearts. Come with fasting, weeping, and mourning. Don't tear your clothing in your grief, but tear your hearts instead.' Return to the Lord you God, for he is merciful and compassionate, slow to get angry and filled with unfailing love. He is eager to relent and not punish" (2:12, 23). Nelson's topical Bible index . 1997, c1995 (electronic ed.) (347). Nashville: Thomas Nelson. Not to be confused with: Thirteen other men of the same name in the Old Testament, including a son of Samuel (1 Sam. 8:2), and a Levite who helped cleanse the temple during the reign of King Hezekiah of Judah (2 Chr. 29:12). Family: Son of Pethuel (“Vision of God”). Occupation: Unknown, though some believe he may have been a farmer due to his many allusions to agriculture. 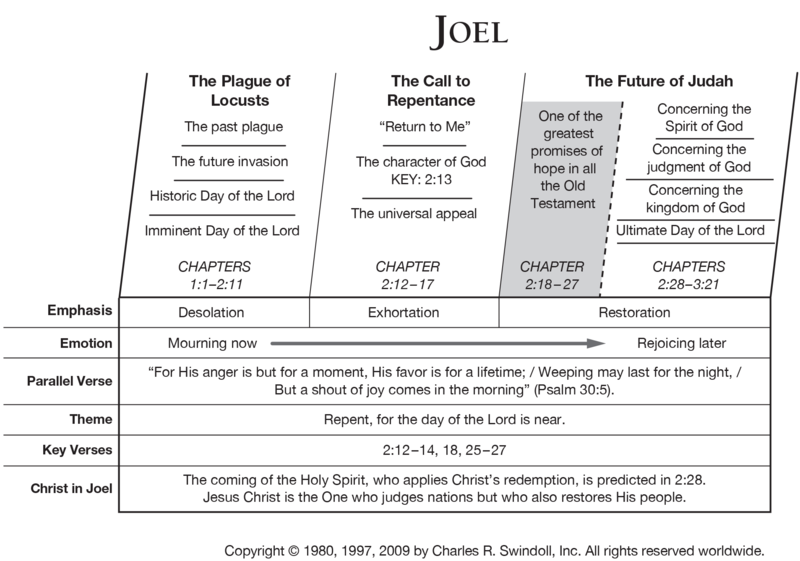 Best known today as: The prophet whose visions of the outpouring of God’s Spirit (Joel 2:28–32) are contained in the Book of Joel. Word in life study Bible . 1997, c1996 (electronic ed.) (Jl 1.3). Nashville: Thomas Nelson. Served as a prophet to Judah, possibly from 835-796 B.C. Wicked Queen Athaliah seized power in a bloody coup but was overthrown after a few years. Joash was crowned king, but he was only seven years old and great need of spiritual guidance. Joash followed God in his early years but then turned away from him. A plague of locust had come to discipline the nation. Joel called the people to turn back to God before an even greater judgment occurred. God judges al people for their sins, but he is merciful to those who turn to him and offers then eternal salvation. The locust plague was only a foretaste of the judgment to come in the day of the Lord. This is a timeless call to repentance with the promise of blessing. Just as the people faced the tragedy of their crops being destroyed, we, too, will face tragic judgment is we live in sin. But God's grace is available to us both now and in that coming day.